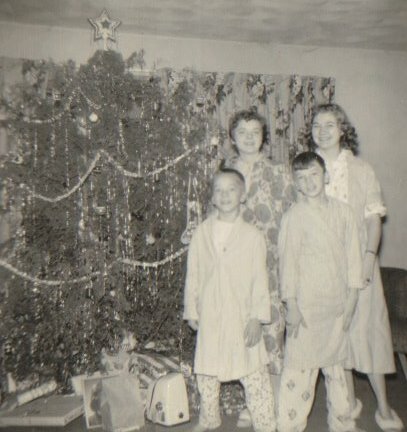 WE ALWAYS HAD A FRESHLY CUT PINE TREE to decorate for Christmas when I was growing up. And since it was a real tree, we couldn’t leave it up for weeks – so we decorated the tree on Christmas Eve and left it up for a week until New Year’s Day. By that time, the needles were drying out from standing in the living room with a fireplace, and it was becoming a fire hazard. After a few years, Mom bought a tree stand with a well at the base to hold water. I thought it was my job to check the tree stand each fay and refill with water if needed. I DON’T HAVE A MEMORY OF GOING TO THE CHRISTMAS TREE FARM to cut our own tree, as many folks have, but Dad brought home the biggest tree from a fresh tree lot that would fit in our living room. He would get out his saw, cut two boards for a stand and nail them in the shape of a plus sign to the bottom of the tree. We would cover the boards with a cotton sheet. If the tree was too tall for the room, he would cut off the top to make it reach near the ceiling, leaving room for a plastic white and red star that was lit from within. FAMILIES DEVELOP THEIR OWN TRADITIONS for decorating the Christmas tree. In our house, it was Dad’s job to put up the tree – then, he arranged the strings of lights, taking care to spread the lights equidistant throughout the tree – as his engineering mind dictated. 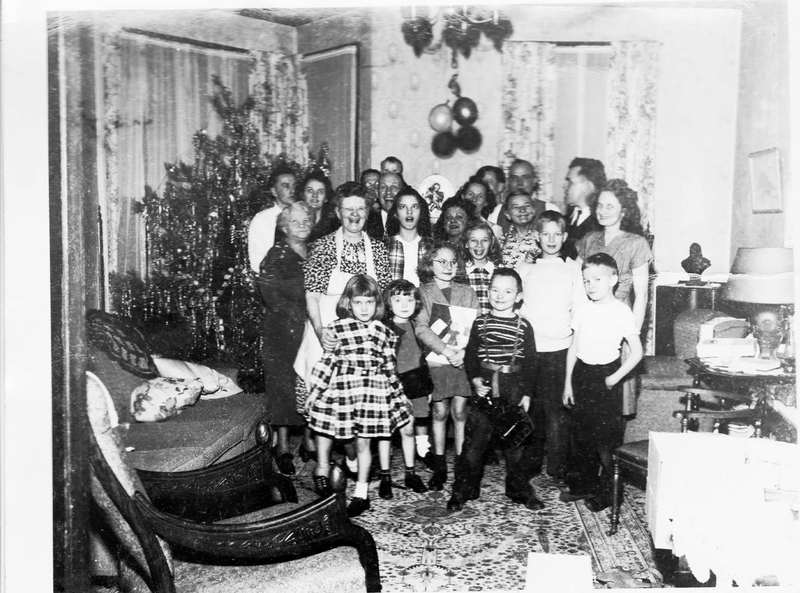 Decorating the tree with lights was no simple matter in those days, as even one burned out light would prevent the entire string from lighting – and the bad bulb had to be tracked down and replaced. ONCE THE LIGHTS WERE LIT, the children decorated the tree with the unpacked Christmas ornaments. 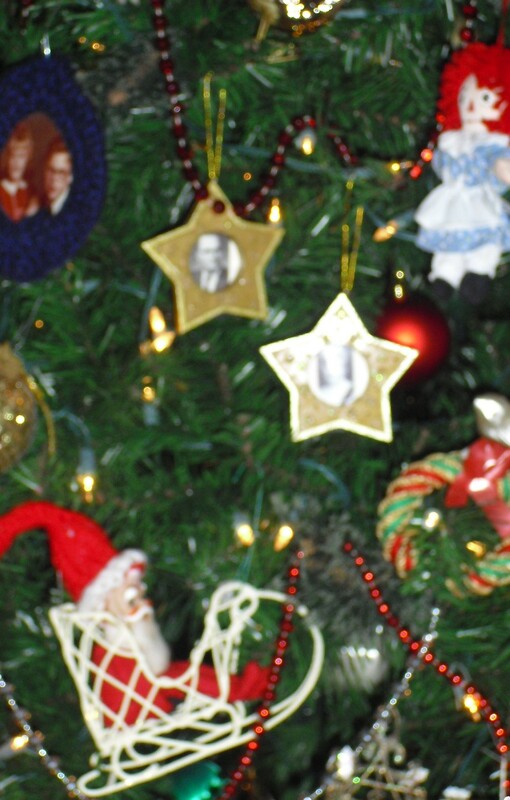 In addition to store bought ornaments, we had school-crafted paper santas, reindeer and snowmen – and occasionally even red and green construction paper chains – that found their way onto the tree. Mom always made us feel that our art projects were beautiful and added something special. REMEMBER THE SILVER TINSEL? Dad told us that the tree would be its most beautiful if we took great care to hang each tinsel string separately… no throwing it on the tree. It takes awhile to hang a separate piece of tinsel from each branch, with the tip end hanging on one branch and the dangling silver string reflecting the lights. We all thought the tree trimmed with silver tinsel was a wonderful sight to behold. Don’t you agree the tinsel tree is lovely? GRANDMOTHER MARQUIS always had a huge tree in the big bay window in her living room.. I don’t remember a tree at Grandma Mamie’s. but I do remember the smells of apples and cinnamon in her house. That’s me holding tightly to my new books and my sister Nancy beside me with her new purse. 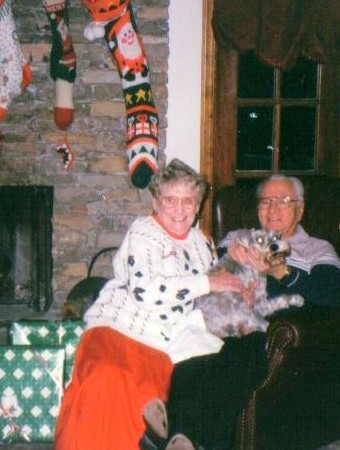 MOTHER loved Christmas. After her children were grown, she decorated her home for the holidays with a little something in every room – including a big Christmas tree in the family room, and small trees in the kitchen and in each of the bedrooms, where her children and grandchildren would be sleeping. CHRISTMAS IS A SPECIAL TIME of year, and I enjoy all the festivities associated with the holidays. We usually put our tree up the day after Thanksgiving and leave it up until January 2nd. The house seems more festive to bake, write Christmas cards, listen to holiday music, make shopping lists, wrap gifts, entertain friends and just sit by the fire enjoying the tree with family. WHEN JANUARY 2ND ARRIVES, I am more than ready to put away the holiday decorations and welcome the new year. The house always looks clean and refreshed somehow with the colorful decorations put away for another year. FOR THE MONTH OF DECEMBER, HOWEVER,…OUR HOUSE IS A CHRISTMAS HOUSE with its colorful rooms, rich and savory food, family traditions, anticipation, laughter, holiday music and secrets afoot. I would love to read about some of your traditions for decorating the Christmas tree. I inherited the family tree from my grandmother and we still have it in our attic. The ornaments bring back so many memories. Now I have family tree of our own that we’ve been using since the kids were little. My favorite ornaments are the ones with photos of people over the years. Hi Sue, I remember tinsel! It was the tin kind that woukd tangle and crush into a ball if you weren’t careful. Sounds like we had very similar traditions growing up (even the old photo!). We always have a real tree. We now go out to the farm to collect it (we used to chop/saw it down when living in Wisconsin, but they don’t seem to trust you with a saw here in Britain) then bring it into the house sometime in mid-December and decorate with all the things we’ve collected over the years (by the way, I love the Raggety Anne). Then, British tradition says that the tree should be taken down by January 5th (Epiphany). Loved the post! A second career, huh. Hmm. Nope. I don’t think I’m funny, I just let it rip. Must have something to do with a.g.e. Shh. Don’t tell.